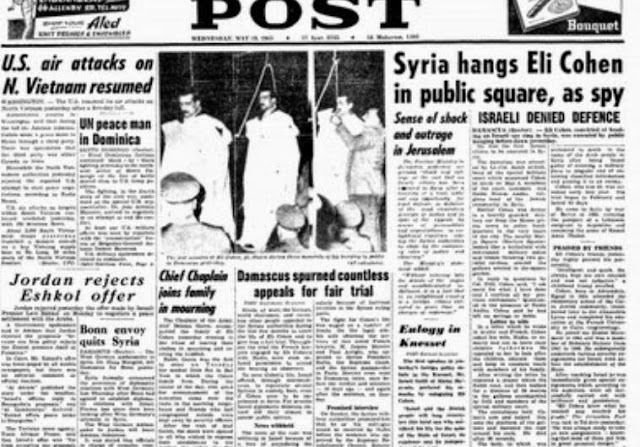 On May 18, 1965, Eli Cohen, the Israeli intelligence agent who succeeded in penetrating the highest levels of Syria’s political and military elite before being arrested and convicted of espionage, was executed by hanging in Damascus’ Marjeh Square. Even though it was two years before the Six-Day War, more than any one single person Eli Cohen was the hero of the June 1967 conflict. He was recruited into Israeli military intelligence in 1960. He was given a false identity as a Syrian Arab who was returning to Syria after living in Argentina. To establish his cover, Cohen moved to Argentina in 1961. Early the following year, Cohen moved to Damascus. For the next few years, using the alias Kamel Amin Tsa'abet. Cohen gained the confidence of many Syrian military and government officials, and sent intelligence to Israel by radio, secret letters, and occasionally by visiting Israel in person. After a showcase trial, he was found guilty of espionage. He was publicly hanged by Syria on May 18, 1965. To this day Syria refuses to return Eli Cohen's remains to his family for burial in Israel. 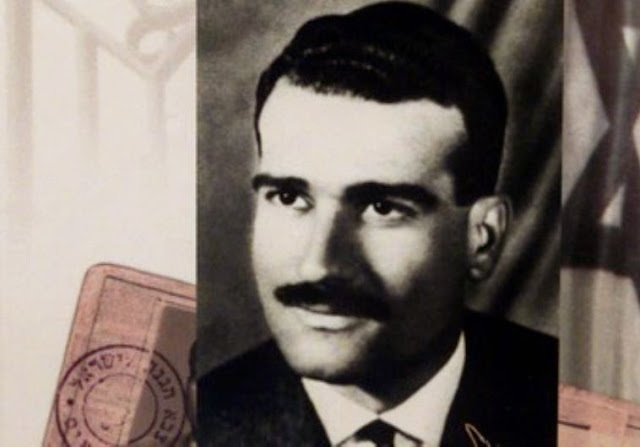 Forty-three years have passed since he was executed, but Eli Cohen - "Our Man in Damascus" - is still considered by the defense establishment as the greatest spy in Israeli history. On Monday, The Jerusalem Post interviewed the man who for three years received and decoded the transmissions Cohen sent back to Israel from deep inside Syria. Cohen operated behind enemy lines - establishing close ties with the top Syrian political and military leadership - from 1962 until he was hanged almost exactly 43 years ago on May 18, 1965. 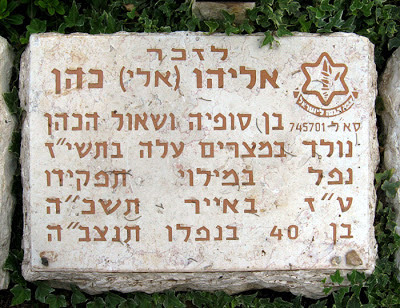 "A," today a 62-year-old veteran of the Israeli intelligence community, was a 20-year-old radio operator with Military Intelligence (MI) when in 1962 he began receiving the daily radio transmissions from Damascus. "I didn't know who was sending the messages," A told the Post on Monday during a tour of an exhibition on MI's history that will open to the pubic on Independence Day. "It was, however, clear that the short messages were of extreme importance, which later helped determine Israel's destiny ahead of the Six Day War." Cohen's transmissions were instrumental in helping the IDF prepare for the 1967 war with Syria. He provided information about the Syrian Air Force and military positions on the Golan. Mossad chief Meir Amit has been quoted as saying: "Eli succeeded far beyond the capabilities of most other men." According to "A," Cohen used to send daily messages always at the same time of the day - 8:30 a.m. Cohen, who was known in MI by the number 566, wrote in encrypted French and sent his messages via a tiny radio transmitter. As part of Israel's 60th celebrations, MI chief Maj.-Gen. Amos Yadlin decided several months ago to open up the branch's Glilot training base outside of Tel Aviv to Israeli citizens and to put on display there a widespread exhibition spanning 60 years and detailing Israeli Military Intelligence history as well as its many successes. The last original message that was transmitted to MI headquarters in Israel by the Syrian military following Cohen's capture: "To [prime minister] Levi Eshkol and the handler of his spies: Kamel [Eli Cohen's fake identity in Syria] and his friends have been staying by us for some three years. Signed by: Syrian Arab Intelligence." "There was great excitement and sadness," he said. "We ran to our commander with the message and he passed it on to Eli Cohen's handlers and we understood that it was over. "Cohen was tortured and convicted by a military tribunal which had denied him a lawyer. Despite many appeals, including from Pope Paul VI and the governments of France, Belgium and Canada, to persuade the Syrian government to commute the death sentence, Eli Cohen was executed in Martyrs' Square, Damscus, in May 1965 before some 10,000 spectators. May Eli Cohen's memory always be for a blessing, he was a true hero.